The first-century church in Corinth was a mess when Paul wrote his first epistle to the Corinthians, New Testament scholar Bruce Winter said at Samford University's Beeson Divinity School this week. The church was being shaped by the philosophy of the culture around it instead of being transformed by "the culture of the Cross," he said. Winter, research professor and director of the Institute of Early Christianity at Queensland Theological College in Australia, delivered Beeson's annual Biblical Studies Lectures Feb. 5-7 in Hodges Chapel. His theme was "Paul's Pastoral Paradigms for Preachers." Winter condensed the Apostle's paradigms to a call to be sensitive, selfless and sacrificial. He urged 21st century pastors to follow Paul's example of seeking the underlying cause of problems in the church. He said the corrective for the selfish attitude that plagued Corinth and also many churches today is the realization that God is not here for us. "We exist for him," said Winter. Winter, who formerly served as principal of the College and Warden of Tyndale House biblical studies library in Cambridge, U.K., is an expert on early Christianity in the Graeco-Roman World. Of the study of Bible backgrounds, he cautioned, "We don't use the background to eliminate the text, but to illuminate it." Beeson professor Frank Thielman said of Winter, "He opened the door to Paul's pastoral study. He took us on a tour through first-century Corinth with a focus on Paul's pastoral skill." The Biblical Studies Lectures are one of three annual lectureships hosted by Beeson to enhance the spiritual life of the community and educational experience of students. The lectures are presented in alternate years by Old and New Testament scholars. 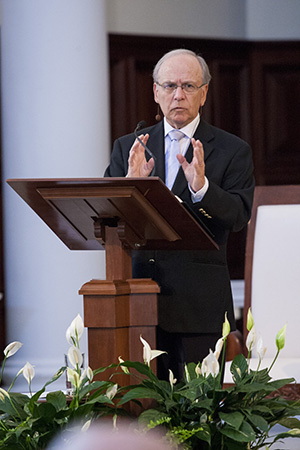 Recordings of Winters' three lectures may be purchased from the Beeson Divinity Media Center by calling 205 726-4098.